Syrian pro-government forces in eastern Aleppo have been killing people, including women and children, on the spot in their homes and on the street, the United Nations says. The UN's human rights office said streets were full of bodies. Meanwhile, the UN children's agency cited a doctor as saying a building housing as many as 100 unaccompanied children was under heavy attack. Rebels, who have held east Aleppo for four years, are on the brink of defeat. Thousands of people are reportedly trapped in the last remaining neighbourhoods still in rebel hands, facing intense bombardment as pro-government troops advance. The Syrian government's ally Russia, which has rejected calls for a humanitarian truce, earlier said any atrocities were "actually being committed by terrorist groups", meaning rebel forces. Rebel officials said on Tuesday that an agreement had been reached to evacuate civilians and fighters from besieged areas but there has been no confirmation from the Syrian government or Russia. The UN Security Council will discuss the situation in Aleppo later on Tuesday. What's happening in rebel areas? "We're filled with the deepest foreboding for those who remain in this last hellish corner" of eastern Aleppo, UN human rights office spokesman Rupert Colville told a news conference. He said that 82 civilians had reportedly been killed by pro-government forces, of whom 11 were women and 13 children, adding that the death toll could be much higher. "Yesterday evening, we received further deeply disturbing reports that numerous bodies were lying on the streets," Mr Colville added, while admitting it was hard to verify the reports. "The residents were unable to retrieve them due to the intense bombardment and their fear of being shot on sight." 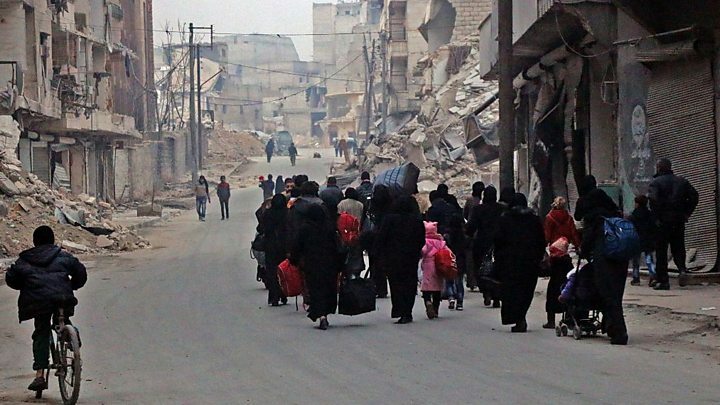 Meanwhile, Unicef quoted a doctor in the city as saying: "Many children, possibly more than 100, unaccompanied or separated from their families, are trapped in a building, under heavy attack in east Aleppo". Ibrahim abu-Laith, a spokesman for the White Helmets volunteer rescue group, said 90% of their equipment was out of operation and only one medical point was still working in the besieged areas. There was no first aid equipment left, he added. He said volunteers were using their hands to pull people out of rubble, but some 70 people were stuck and could not be extracted. 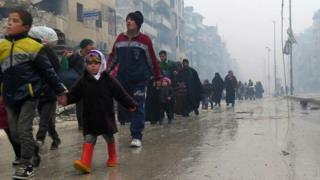 It is hard to know exactly how many people are in the besieged areas, although one US official with knowledge of efforts to secure safe passage for people in the city told the BBC that there were around 50,000 people. Other local sources say there could be as many as 100,000, with people arriving from areas recently taken by the government. Activist Lina Shamy: "Humans all over the world, don't sleep! You can do something, protest now! Stop the genocide". Bana Alabed, aged 7: "I am talking to the world now live from East #Aleppo. This is my last moment to either live or die." White Helmets tweet: "All streets & destroyed buildings are full with dead bodies. It's hell." Abdul Kafi Alhamado, teacher: "Some people are under the rubble, no-one can help them. They just leave them under the rubble until they die - these houses as their graves." How close are rebel-held areas to falling? Russia's military says 98% of the city is now back in government hands. 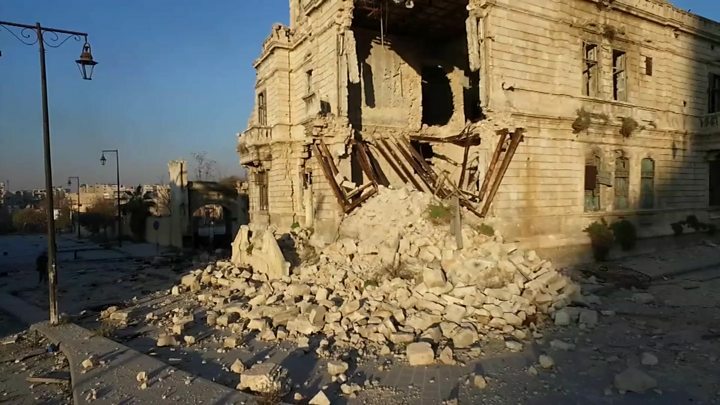 The UK-based monitoring group, the Syrian Observatory of Human Rights (SOHR), has also said the battle for Aleppo had reached its end, with "just a matter of a small period of time" before "a total collapse". What is the world saying about it? UN Secretary-General Ban Ki-moon said he was alarmed by the reports of atrocities and had instructed his special envoy to Syria to "follow up urgently with the parties concerned". France and the UK requested an emergency meeting of the UN Security Council for Tuesday to discuss "the worst humanitarian tragedy of the 21st Century unfolding before our eyes," AFP quoted ambassador Francois Delattre as saying. The meeting will be held at 17:00 GMT. The UN's humanitarian adviser on Syria, Jan Egeland, earlier spoke of "massacres of unarmed civilians, of young men, of women, children, health workers". He named a pro-government Iraqi Shia militia as being responsible for the killings, but placed overall blame for any atrocities in the hands of the Syrian and Russian governments. "Those who let them loose in this area are also accountable," he said. In response, Kremlin spokesman Dmitry Peskov said Mr Egeland was not in full possession of the facts on the ground. "If he did, he would be paying attention to the atrocities that are actually being committed by terrorist groups," he said. For much of the past four years, Aleppo has been divided roughly in two, with the government controlling the western half and rebels the east.